China is on many Travel Bucket Lists for many reasons; culinary, historical and cultural experiences are everywhere. Visit a destination that is very different from your own. Include a cooking class, yoga/Pilates session, calligraphy workshop, photography immersion, interior design shopping or a host of other preferences! 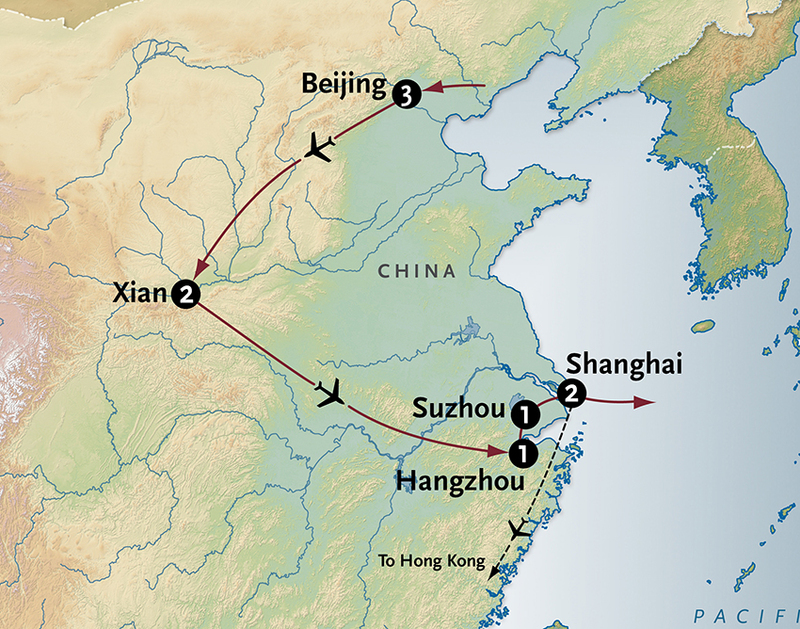 While known to many for its famed Terracotta Warriors, Xian is the oldest of China’s imperial capitals and was the origin of the great Silk Road, a vast network of trading routes which stretched from China through Central Asia, across India, and to the Mediterranean. The Silk Road was traversed not only by silk traders, but by armies, religious organizations, political figures, and traders in other commodities such as spices, precious metals, and other foodstuffs. Knowledge also traveled along the route, providing a key conduit for science, religion, and philosophy throughout the ancient world. Cities along the Silk Road to this day are cosmopolitan and polyglot in their architecture, their populations, and, of course, their food. It was along the Silk Road that Islam made its way to China and specifically to Xian in the seventh century. The Muslim community was permitted to worship in Xian, and settled in to what is today called “Muslim Street” and have been a part of the city’s rich and diverse cultural fabric ever since. The Muslim Quarter today is a boisterous, colorful, and delicious street food scene. The streets are lined with food shops, restaurants, sidewalk cafes and kiosks, serving up a dazzling range of regional specialties and delightful examples of Silk Road cuisine. This is must-see during any visit to Xian, but be sure to bring along a hearty appetite, because picking and choosing what to sample is a major challenge. + Xian is renowned for its bird-shaped “jiaozi” dumplings, which come in a myriad of flavors and filling, on their own or in broth as a soup. + Charcoal grilled meat on skewers similar to Central Asian kebabs is called “rou chuan” in Xian. These are a signature sight and smell of the quarter, made from beef, lamb, chicken, some vegetables, and also a more exotic version made from quails’ eggs — a particular delicacy of the street. + The Chinese obsession with noodles reaches a fever pitch in Xian: watch street chefs knead and stretch the dough in their storefront windows. + Candy is taken very seriously in the quarter, including all kinds of nut based confectionery. Also try persimmon doughnuts, sweet yogurt, candied dates, and other fruit based concoctions. + Succulent new potatoes fried to a crisp in massive vats are another quarter favorite. Let Donna Salerno Travel help with your travel plans to create a range of travel experiences in Asia, China, Xian and beyond! Add in travel extension to Hong Kong. Copyright © 2019 Donna Salerno Travel. All rights reserved.